Berlin, du bist so wunderbar! Especially if you are vegan. 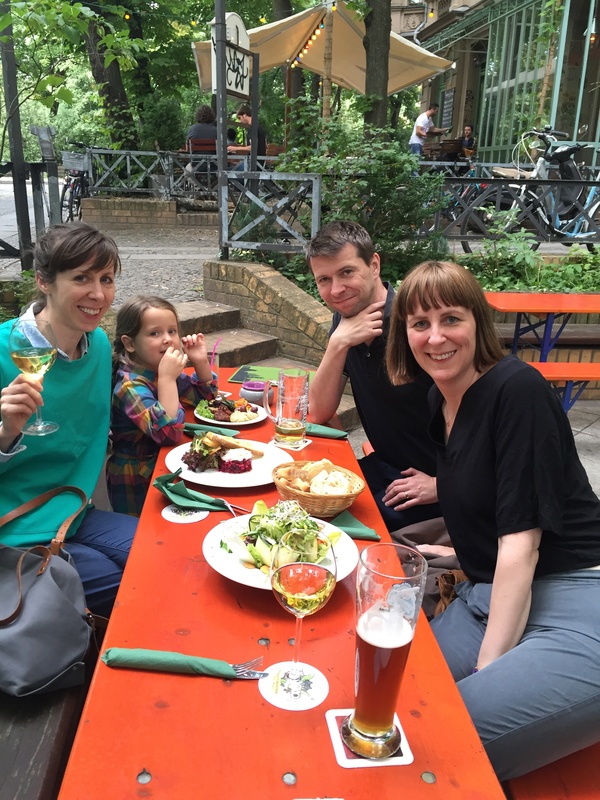 Having just spent five days in the Neukoelln district in the south of the German capital, I am having to pace myself typing as there is so much I want to share with you. Around every corner – even better, every few steps –there are signs and menus showing off what vegan Berlin has to offer. 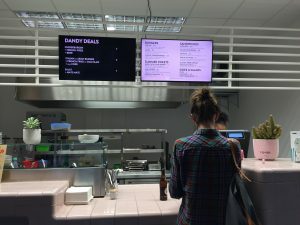 Plant-based menus are as common here as vegetarian options back in London – the city is ten years ahead, and it’s a great sign of things to come. 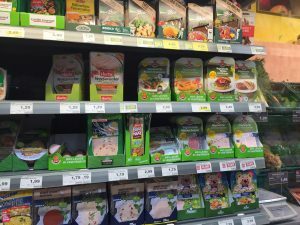 A first taste of the different culture we were staying in came when we popped in to a local mini-market Edeka (think Tesco Express), and I was amazed at the vegan choices on offer. No, I’m not talking about the shock of seeing a banana or apple! 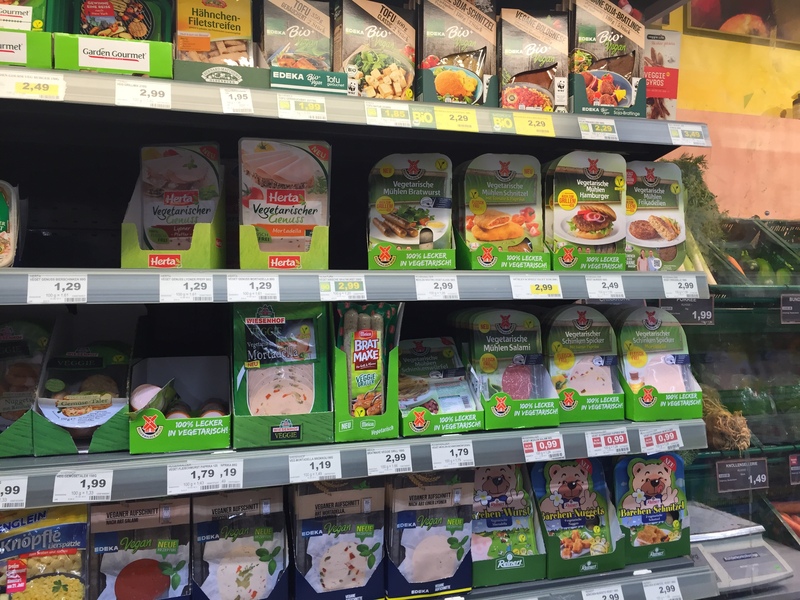 I’m talking about a variety of vegan cheeses, faux meats, dairy-free yoghurts and milk. It was an exciting start to our stay here. 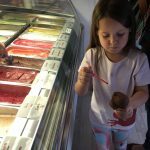 First stop was ice cream at Eis Manufakture on Weserstrasse, one of a few branches across Berlin. 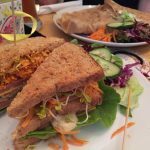 They have a few vegan friendly flavours – just ask the staff who are well informed and friendly. 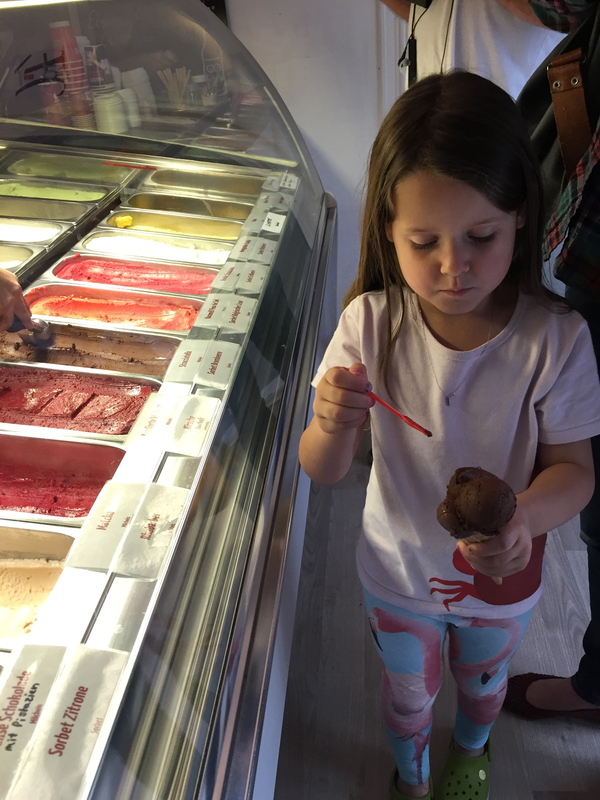 My little girl went straight for the dark chocolate – wise beyond her years. Unbelievably rich and creamy, it was hard to believe that anyone would want a dairy version. Before I got another lick the whole thing had been devoured – bloody kids. Around €1.20 per scoop. 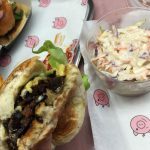 Not hugely obvious it’s a 100% vegan diner, as it’s decorated with a pink neon pig – a deliberate ploy I imagine to lure in meat-eaters and show them what they are missing. 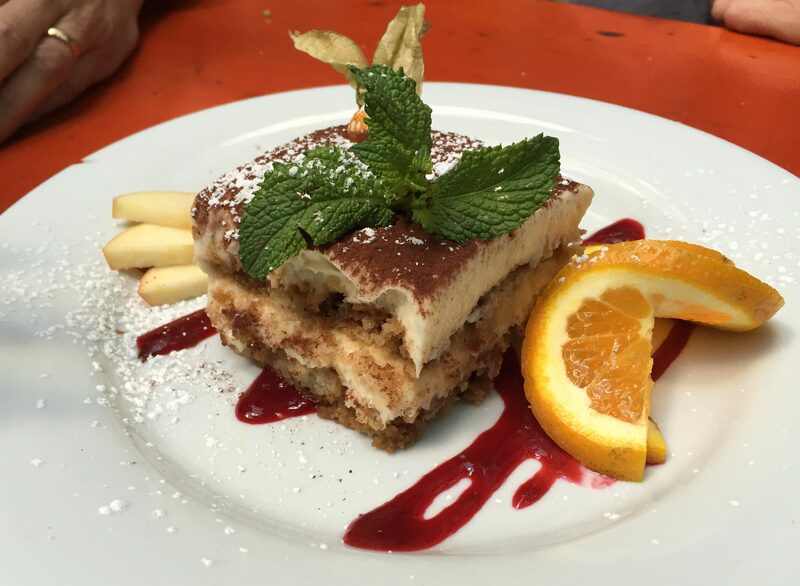 You are in for a treat from the first bite here. 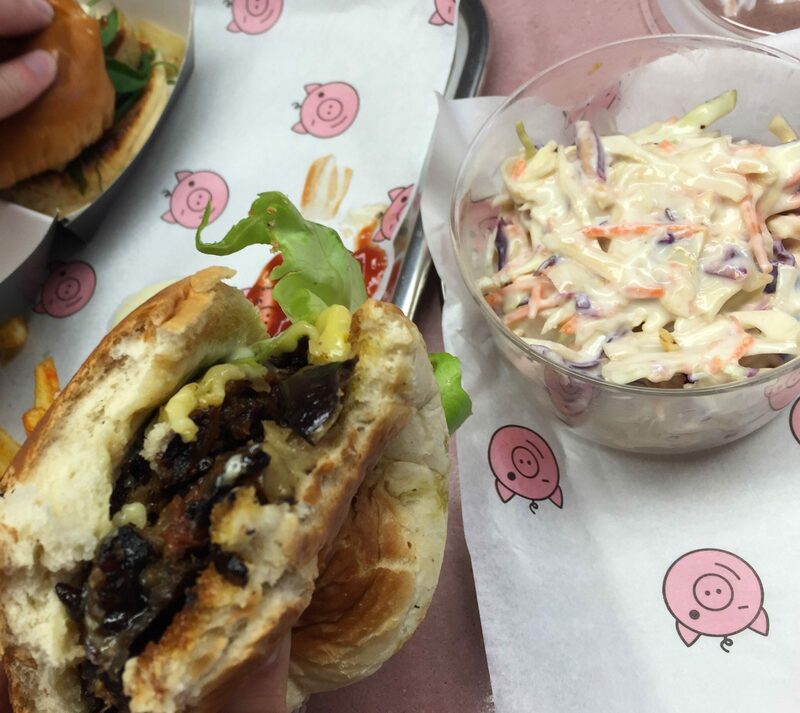 Between five of us, we sampled all the burgers and sides and glugged down a few vegan beers into the bargain. I had the Italian (€5.50) – I’ve had a few in my time – but this one will stick in my memory for all the right reasons. A perfectly seasoned shiitake and red bean patty with cheese, aubergine sauce and aioli, all squeezed into a squishy fresh bap. It’s worth mentioning that they make the best coleslaw too. Lightly dressed, unlike the usual slop served in burger bars, it’s fresh and crisp to cleanse the sinful pleasures of the burger. My daughter had the €3.50 cheeseburger (soy patty, cheese, tomato, salad, pickles, ketchup, mustard), which after scraping the mustard off, went down with some humorous oohing, wows and OMG-ing – McDonald’s, I’d tell you to eat your heart out if only you had one. James and his sisters all went for the Asian tofu burger €5.50 (marinated tofu, kimchi, daikon, crunchy nori, wakame and teriyaki sauce) which I took a gluttonous chunk from. I’m glad I did, as it was very, very good. If I lived here this would be an issue for my waistline because I wouldn’t be able to stay away. Just thinking about my Italian holiday romance has sent me of into a daydream…. I can only drool that something like this will be open on a high street near me. Come to London, Dandy Diner – we can make this work! Start the day with an indulgent, animal-free breakfast at Dots. They cater for all, but I was on a promise that they had excellent vegan croissants here as well as pancakes. Ruby and I went for the pancakes and snuck in a croissant while we waited. I never miss animal products, but I am very happy when cafés like this veganise old staples well like the humble but easy-to-mess-up croissant. Down it went, halved unfairly by Ruby and shared out even more so (that girl has double standards when it comes to food) along side a much-needed strong coffee. As for the pancakes, I think the photo here speaks for itself, but I can confirm that it was intensely glorious and the best possible way to start the day. 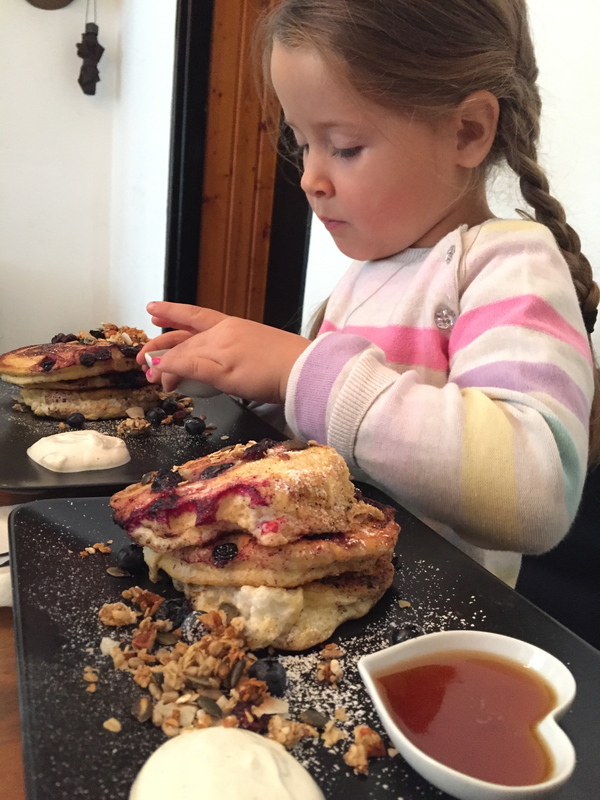 Fluffy, sweet and sparkling with berries, seeds, granola, syrup and yogurt – pure breakfast heaven. I took no chances and ate the lot before wandering hands assaulted my breakfast. Unfortunately, I was too stuffed to try the banana bread or other vegan options displayed on the counter which all looked great, but go for the pancakes (approx. €7). 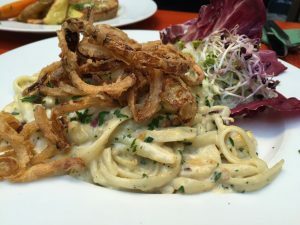 Set a few steps down from street level, you’re in the warm bosom of Berlin’s vegan scene at legendary Berlin plant-based venue Viasko. 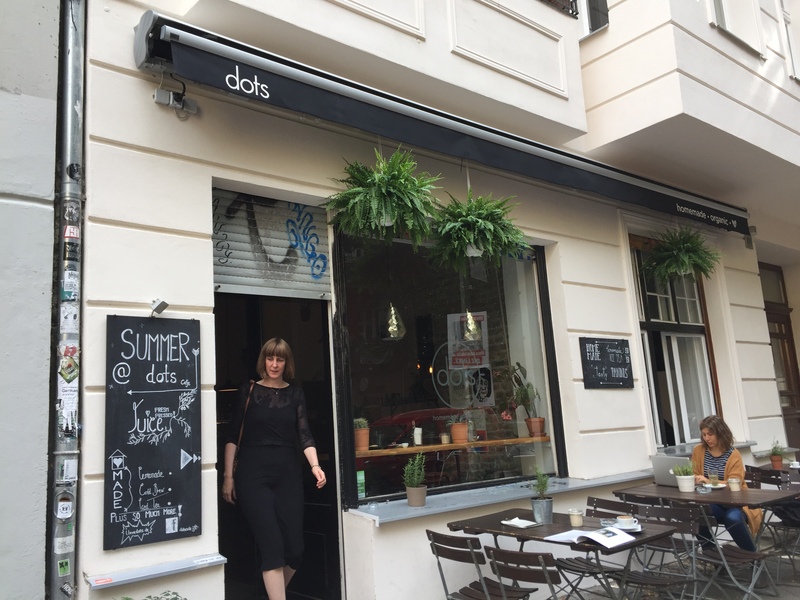 With signs on the door banning fur and even faux fur, and a menu that introduces the establishment as animal-friendly, anti-fascist, pro-feminist and gay-positive, I soon lost myself in the laid-back atmosphere enjoying the warm summer’s evening. There’s an extensive beer and wine list, but the food menu is genuinely exciting for a vegan, shying away as it does from the vegan norms. 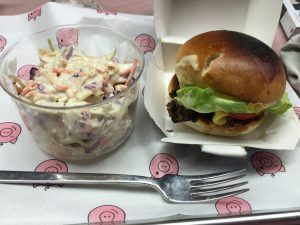 All the food was divine but for me the stand-out dishes were the beetroot carpaccio with an avocado cream, and the spaetzle with a cashew-cheese sauce, smoked tofu and crispy onions. It was heavy, dense and rich and in the best possible way knocked me for six – I was full but kept eating and eating. 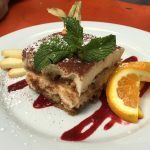 We were all too stuffed for pudding with the exception of our youngest diner, so we ordered a tiramisu. It used to be her favourite dessert so we just had to try a vegan version. 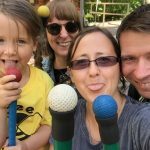 Arriving with five spoons (she was not impressed!) it went in five seconds. We left a few hours later and a few stone heavier but light and joyful in my heart that places like this exist. 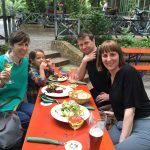 Of all the establishments we went to in Berlin, this was the best experience. 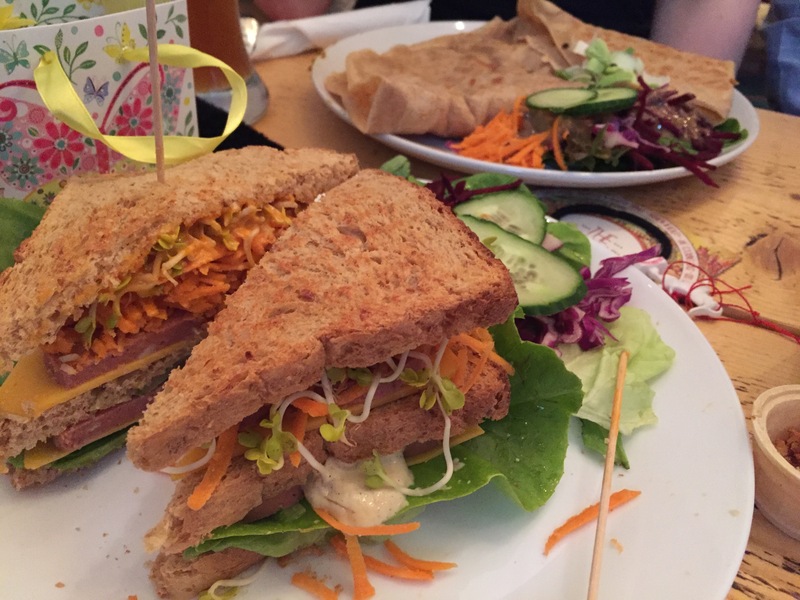 There is no messing about – this is a proper vegan establishment and long may it reign. Viasko gets busy, not surprisingly, so booking is advisable. Starters around €7.50, mains €11, desserts €6. I’ve had a few vegan doughnuts – you know, they are sweet and make you fat – the end. I don’t really hanker after them, but these ones are pretty darn special. 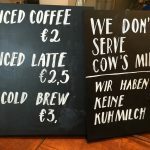 Everything here is vegan and on the counter they clearly state “We don’t serve cows’ milk” – things like that make me smile. 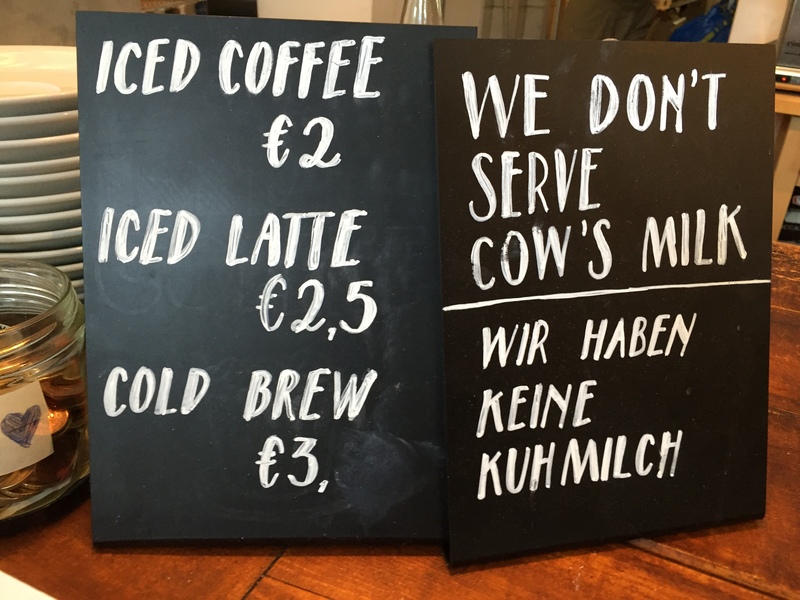 It’s the way it should be – cow breast milk does not belong in our coffees, but in the stomachs of their calves – just sayin’! They have some lovely-sounding bagels (e.g. barbecue tempeh, Portobello mushroom and walnut rocket pesto), although unfortunately they had sold out of these by 3pm. And there was a dazzling, colourful array of light, fluffy and tempting doughnuts, their sticky glazes glistening in the August sun. We took a box of four. This is the way to my family’s hearts and of course, no animals were hurt for their pleasure – which just makes them taste even more delicious. Either a move to Berlin is on the cards – or a cholesterol check. 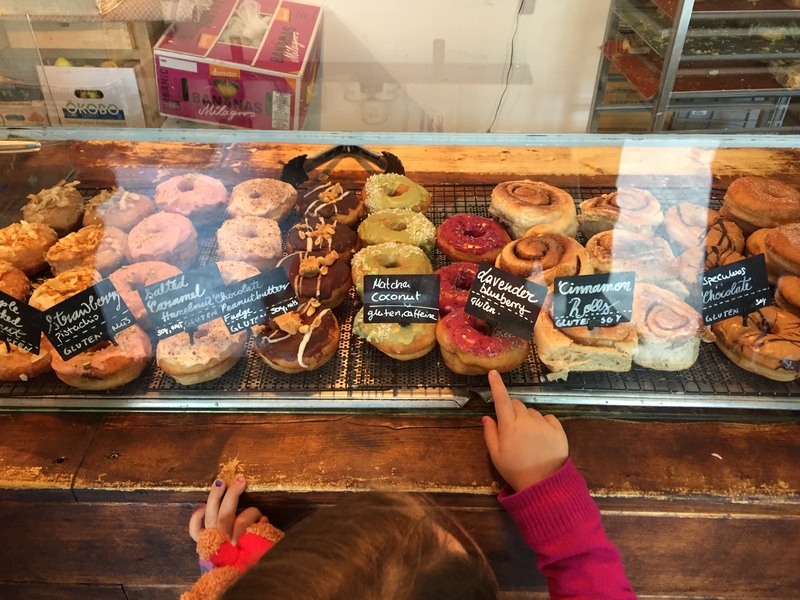 As well as running the coffee shop, Brammibal’s also appears at local markets and are worth seeking out. 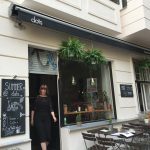 It’s tough choosing where to eat dinner in vegan-friendly Berlin, but Let it Be won our custom on this occasion. 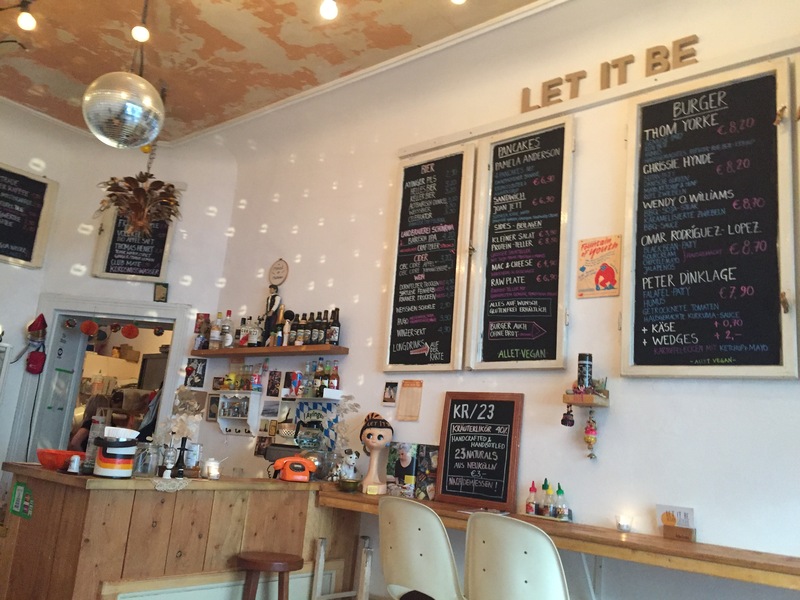 A chilled-out café with an informal and cheery vegan vibe, thoughtfully laid out with a little shelf of kids’ toys and books, lots of local vegan info on display and our beloved Morrissey on the playlist. They serve up crepes, sandwiches, burgers and lots of great craft beers (bottled) to wash it all down in fridge-cold steins. 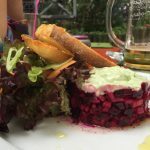 The dishes are named after famous vegans such as Prince, Moby, Pamela Anderson and Daryl Hannah, and the menu is in English and German. I had a Joan Jett sandwich – triple layers of very tasty cheese, faux meat with plenty of salad and sauce. 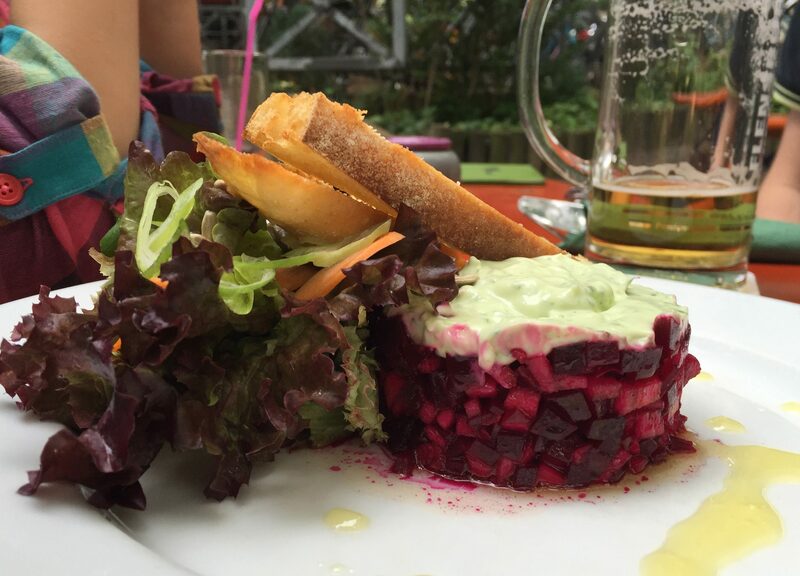 Germany really has its vegan cheese sorted out! To conclude: a charming café where you could quite easily laze the end of the day away (opens at 4pm). Along this road a few doors down was a vegan pizzeria (Sfizyvegg.de) that looked really good as well, but not even I can eat a pizza after dinner. This is on the list for the next visit. 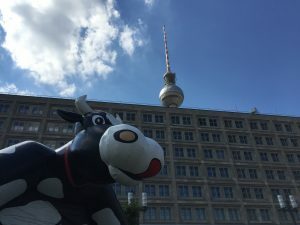 By very happy coincidence, this three-day vegan festival started on our last day in Berlin, so I bundled my gang onto the U-bahn to check it out in Alexanderplatz, in central Berlin. It was an especially hot day, and we managed an hour or so to check out and chat to some lovely exhibitors before the heat and flight sent us packing back to London. 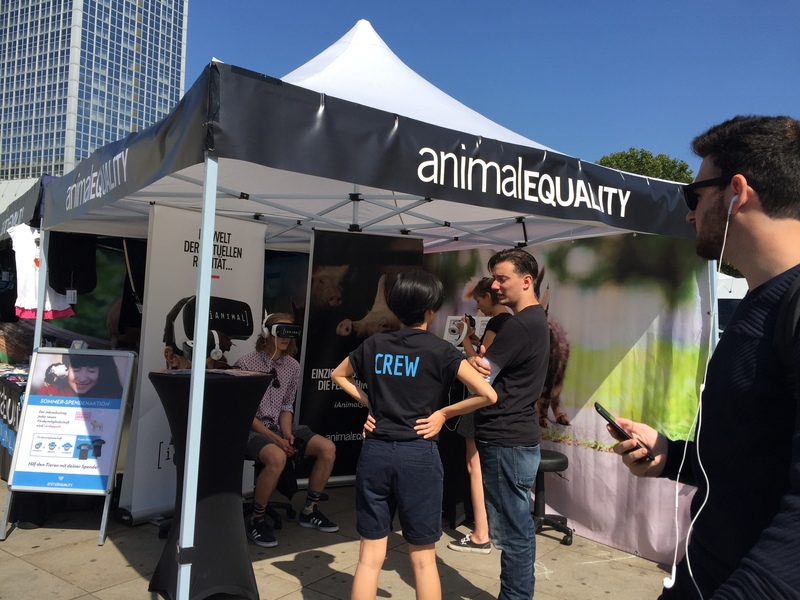 Ever present and thankfully so was animal rights organisation Animal Equality with their virtual reality film goggles. I was delighted to see Willis of London selling their brilliant faux leather shoe and boots – I have a pair of their grey boots and love them, worth checking out if you are uncomfortable wearing another creature’s skin. 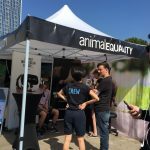 However exciting the vegan food and merchandise is at the festivals it’s always good, especially for the non-vegans visiting, to have a stark reminder of what life is really like for farmed animals. 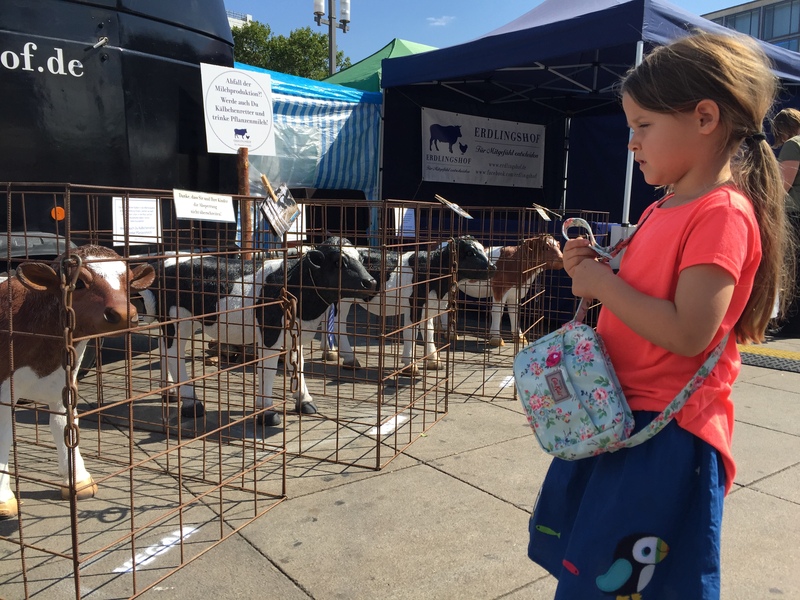 At the festival there were two particularly sobering examples: one was a series of life-sized models of a sow trapped in a farrowing crate, an utterly disgusting invention designed to rob a mother of the wonders of birth and any maternal instincts care to her offspring. 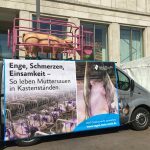 The suffering inflicted on her and her babies is painful to imagine but a reality for the vast majority of commercial pigs. The second example on show of the horrors of modern farming was a row of model calves, crated shortly after birth and never to know their mother’s warmth, love or milk – the cow breast milk that humans demand. This happens usually with in a few days, even hours of life . Stolen babies, inconvenient byproducts of the dairy industry. Again, a violation of the wonders of birth and the female’s body to create milk for her babies. Thanks though to places like the Land Der Tiere sanctuary whose volunteers I met that day, a few of these beautiful but abused creatures do find kindness in some humans and refuge from people’s forks. 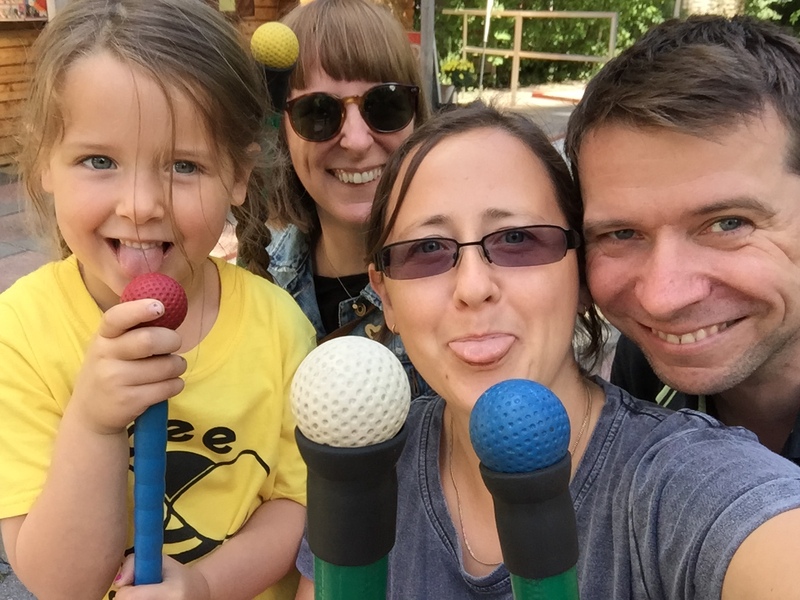 I wasn’t aware of this place, otherwise I would have made the trip to see them during our holiday – that’s another excuse to come back to Berlin. 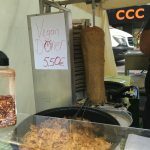 Wandering round deciding what to eat, I came across a vegan version of Berlin invention the doner kebab . Being English I just had to check it out. Looking and tasting very much like the meat version I couldn’t believe how good it was but minus all the grease – we all had a bit and agreed this vegan kebab pulled it off to perfection. 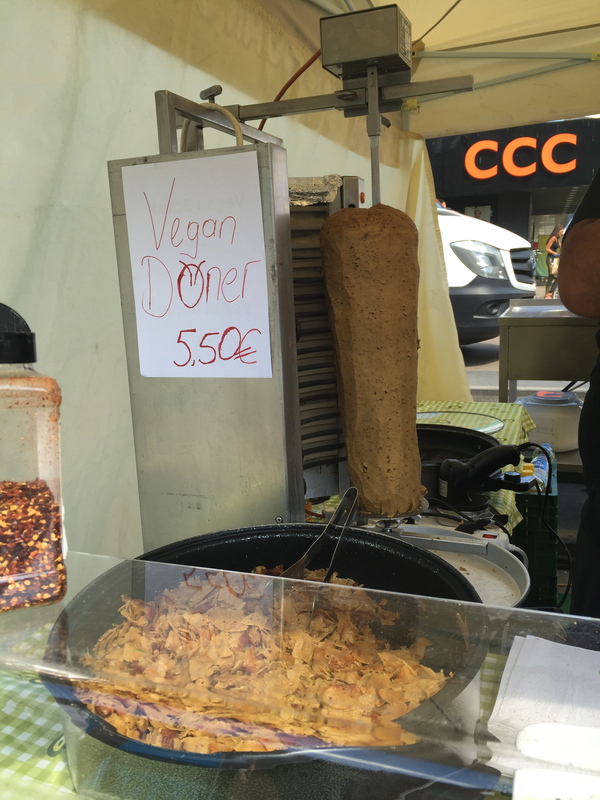 Well, as perfect as a doner can be! Vegan alternatives never cease to amaze me. 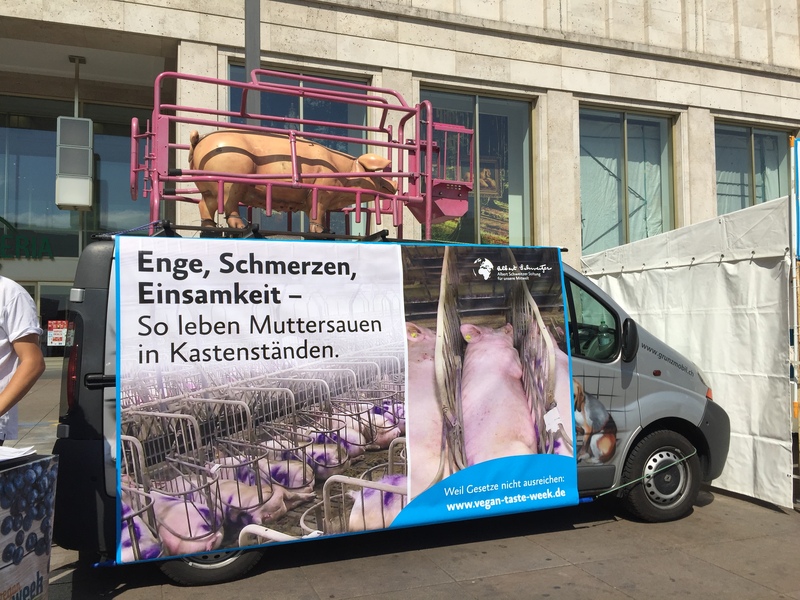 I had heard Berlin was the vegan capital of Europe and I just really hope London catches up soon. Once you get used to so much good-quality vegan produce and restaurants on tap it’s hard to go back in time. C’mon London, we are getting there but we can do so much better!